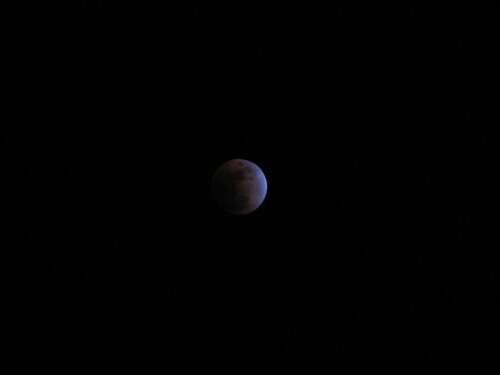 Total lunar eclipse last night... and proof that I really need a tripod because this was the best picture I could manage. What color ink should I use this semester? I've just emerged from roughly three weeks of no successful lab work. My sequencing gels just refused to polymerize, no matter how careful I was in measuring ingredients and mixing. The only reasons I could come up with were: 1) bad chemicals, 2) I am incompetent and/or have gone insane, or 3) poltergeists. We decided that #1 would be the easiest to rule out, so we ordered all new chemicals. Lo and behold, I made a successful gel last week, replete with pretty sequences. Hooray! However, #2 and #3 are still not ruled out. An old man in a silver SUV stared at me and then waved this morning, while I stood on the platform in my eight layers of outerwear waiting for the train. I looked like the Michelin man. Either he thought he knew me, or his standards are very low. Giving the first exam of the semester tomorrow. Not too many student questions yet, other than the usual "Do we have to know this? how about this?" The grading is going to be horrific because not only is it a huge class, but it's a 75-minute exam. I'm mentally preparing myself for a very long and tedious week. Lunar eclipse tonight! Fingers crossed for clear skies! Am still reeling from the news of the shooting at Northern Illinois University yesterday, in which 5 people (plus the shooter) have died so far. NIU is about an hour west of here; many of my friends from high school went there. I wrote to a friend who is there now and commiserated last night. There is no difference between that lecture hall where an undergrad geology class was underway, and the lecture halls where my own classes are conducted. I've already heard calls for closing campuses, requiring locked doors and IDs to enter the grounds. This of course is impractical but also damaging to the very ideals that American (and most other) universities hold dear: open access to resources, community membership, academic (and other) freedom for all. Schools trust their users to behave as adults and take responsibility for their actions. Educational resources like libraries are there for everyone (with certain permissions to remove materials). A visitor should be allowed to sit on the quad or use the cafeteria without having to go through a checkpoint. Unfortunately, the openness that goes hand-in-hand with educational freedom also entails risks. Sometimes we get homeless people sleeping under our staircase. Sometimes evil men with cell phone cameras take pictures in the women's bathroom. Sometimes chalkers or leafletters advertise for causes we disagree with. And sometimes someone with a gun and a grudge can walk right into a classroom and make a statement. The cost of preventing that kind of access, here in the places where we learn to express our freedoms and opinions, would be very high. I don't know what the answer is. But I do know that teaching my review session on Monday is going to be very uncomfortable. I wish every psycho with a deathwish would do the rest of the world a favor and go off themselves privately and not take anyone else with them. 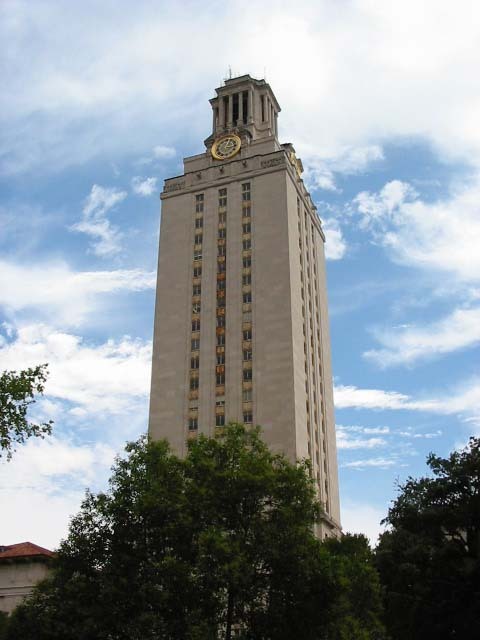 The bell tower at University of Texas where Charles Whitman started the school shooting craze in 1966. I am SO tired of the advertising gimmick in which someone pretends to have made a whole list of points, and is doling them out to you in arbitrary order. "Reason number 23 to shop at Carmax," "Marshall's Law number 17," etc. etc. Wouldn't it be more convincing if they just told us Reason #1 and possibly #2? ARGH, so irritating, and SO overused. The only acceptable use is a vastly exaggerated number, like "Reason #335,736,161,991 not to go to grad school." The other advertising gimmick I despise is the disembodied twitching heads, especially stuck on unmatched bodies. Creeps me out. I would link to a picture but I can't bear to even look at such a picture so no links for you. Happy 199th birthday to two of my favorite people, Charles Darwin and Abraham Lincoln! Foley went to her first day of doggy daycare yesterday. 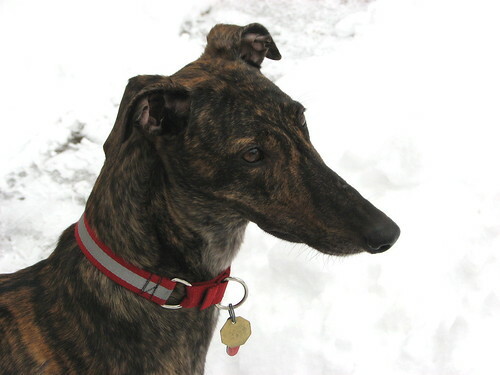 The owner says she did wonderfully well, was social and cooperative at all times. I read over her evaluation and was absurdly pleased by all the nice things they wrote about her. I miss seeing her on camera during the day, but she's much happier this way. Today is an unhappy memory day and I am trying to keep myself busy so I don't think about it. So what's up at chez Bintie these days? 1) Discovered that the stovetop can easily hold an entire can of boiled-over tomato soup. Lesson learned: don't go check your mail when there's milk on the stove. 2) Foley is starting daycare soon. Oh what a yuppie I have turned out to be, but honestly this separation anxiety is very bad for all three of us and we have to do something. 3) How many more huge snowfalls are we going to have? It's nice that nature is giving me plenty of exercise but enough already! 4) I've been reading Jane Austen novels and watching the corresponding movies on PBS during their Jane Austen festival. We started with Persuasion and Northanger Abbey, and now I'm working on Mansfield Park. Unfortunately, MP is much longer and much less interesting. A budding romance between a painfully shy girl and a humorless clergyman? I find myself rooting for the gambler and the golddigger instead. Last week, I was cranking out sequences almost faster than I could analyze them. I was the biggest laboratory rock star you have ever seen, complete with pyrotechnics and guitar solos, and I fantasized about the world-changing breakthroughs I would make this semester. And then: I unlearned how to make a sequencing gel. I made four in a row that just would NOT polymerize; after the requisite two hours, I pulled out the comb and all the gel poured out with it. I've ruled out nearly every chemical (two more to test, next Monday). My labmate's gels work just fine. The corrupting variable appears to be ME. wtf?!? So I didn't feel entirely useless, I did extra PCRs, which all worked beautifully. Now I have this massive backlog of DNA that needs to be sequenced, which of course I am incapable of doing. Smart. On the plus side, my laptop is back home after a month at Laptop Camp, which is like Fat Camp only instead of losing pounds you lose defective motherboards and hinges. As a bonus, they somehow managed to do the work without wiping my hard drive, which saves me many hours of reinstallations. Good-bye, obnoxious Mac computers!